US equities closed moderately mixed, sp +2pts @ 2139. The two leaders - Trans/R2K, settled -0.4% and u/c respectively. 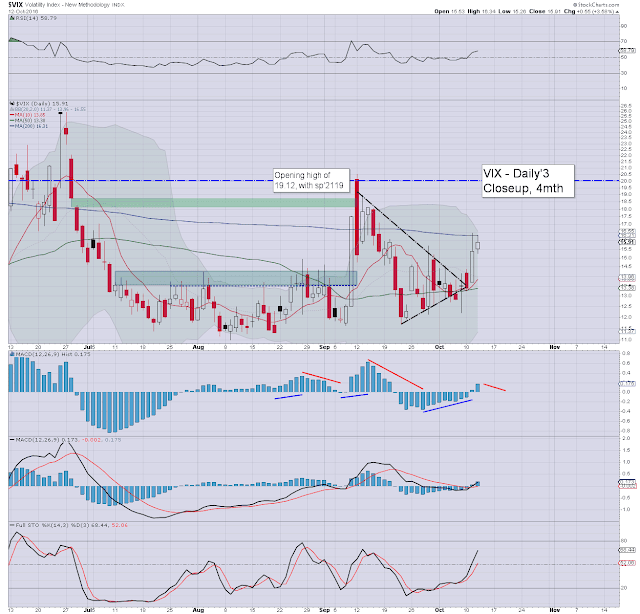 VIX settled +3.6% @ 15.91. 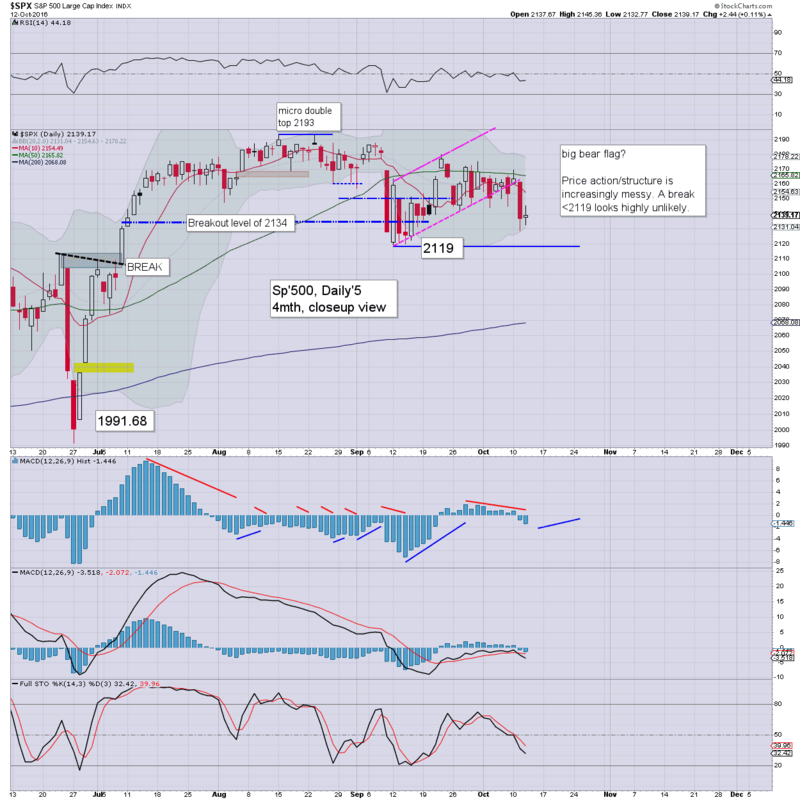 Near term outlook offers upside to challenge the 2161/63 gap zone before the weekend. It was not exactly the most exciting day, with a trading range of just 13pts. The close of sp'2139 should not exactly inspire the bulls, but neither did it offer the bears any follow through from the Tuesday decline. Overall price action remains... messy. VIX managed a second consecutive net daily gain, but we're still only talking about a VIX in the mid teens. Just 3-4 years ago.. the mid teens would have been a typical floor... now its a typical cycle high. I will note, if the week ends on a bearish note.. with Dow <18k, and sp <2119... that would bode for another 3% of downside into early November. I've seen a lot of 'crash chatter' today, and its somewhat ironic that some people are using the C word to describe a possible 3-5% down wave. I like the interviewer - Hunter, he is pretty good, and always gives his guests the time to say what they want. The guest - Holder, is usually interesting to hear. Today's comments though, were classic Gold bug crazy talk. First, the issue that a number of high profile 'end of the world' callers keep pushing their dates out. Holder's defence that at least it inspires some to prepare, I can almost kinda understand. But still... the system collapse callers have been issuing dates for the better part of a decade. Second... and far more bizarre... the notion that 'price doesn't matter' when it comes to buying Gold and Silver. Really? I would merely ask Holder to tell that to anyone who was chasing the metals higher during the spring 2011 bubble. Does Holder seriously think those who bought Gold in the $1900s, or Silver in the high $40s are remotely pleased right now? Many are understandably outright mad as hell, others have no doubt had to sell at a considerable loss to raise cash. I myself am long term bullish for the precious metals, but even on the most optimistic inflationary outlook, its going to take at least another 2-3 years for the metals to be trading at, or above the 2011 historic highs.